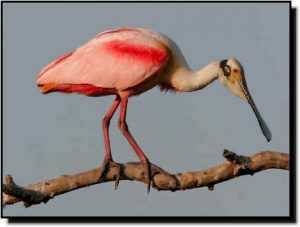 Comments: The Roseate Spoonbill’s size, color and bill are distinctive. When foraging, spoonbills walk slowly in shallow water sweeping their spatula-shaped bills side to side hunting fish, crustaceans and aquatic insects. Roseate Spoonbill numbers plummeted during the millinery trade era. But like many species of waterbirds, they have made a comeback due to protective laws and habitat conservation. Roseate Spoonbills occur in small numbers or are found only in localized sites within the Great Plains.